As summer approaches I have visions of warm beaches, clear skies, and Pina Coloadas dancing in my head. I was all set to make banana bread when I saw two brown bananas hanging around my kitchen. The thought made me feel like domestic diva as I thought how clever I was! Then I decided to get really crazy and make my banana bread taste more like the islands! 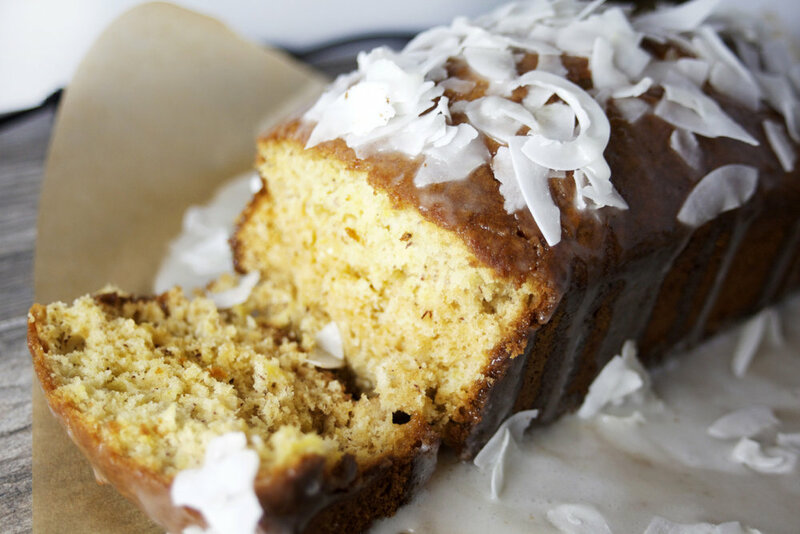 The pineapple adds a lovely sweetness to the bread and the coconut glaze makes you feel like you are vacation. Just for a moment you feel the ocean breeze and imagine yourself eating breakfast staring at the ocean. See how desperate I am?!?! Preheat oven to 350 degrees. Then prepare a loaf pan with some cooking spray or lightly butter. Cream the butter and the sugar in a bowl with an electric beater. One at a time beat in the eggs,and then the extract. Fold in the drained pineapple, the mashed banana. Sift in the flour, baking powder, soda, salt, and mix on low speed until everything is blended. Pour the batter into the loaf pan and give it a good smack or two against the counter. This helps the batter settle in evenly and get out any air bubbles. Bake for about 60 minutes. Then check with a toothpick to see if the bread is baked through. If not put it back in and watch it for another 5-10 minutes. Sometimes it depends upon your oven. Once it is done make sure the bread cools on a rack before you begin glazing. Whisk together sugar, pineapple juice and coconut milk until smooth. Glaze should have a thicker consistency. If glaze is too thick, add more coconut milk, 1 teaspoon at a time. If the glaze is to runny add more sugar a little at a time. Pour glaze over the bread carefully. Then you may garnish with coconut flakes if you have them on hand!